I used the the G1W dash cam. 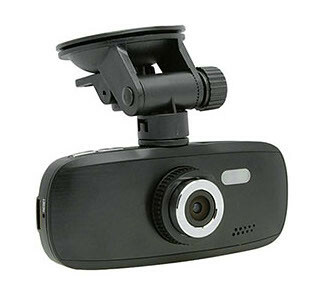 It is $50 and is regarded as the best dash cam for the money with sharp 1080p video quality. 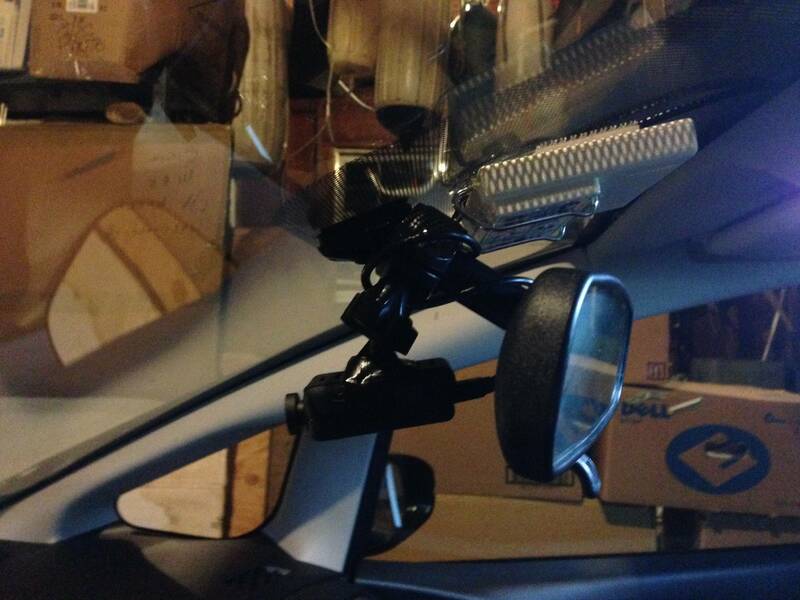 Mount the dash cam's suction cup then tuck the power cable under the ceiling fabric. There is plenty of space up there to run wires. Run the wire over to the passenger side A-pillar, and tuck it under the cover for the side curtain airbag. Continue down the rubber flap inside the door. 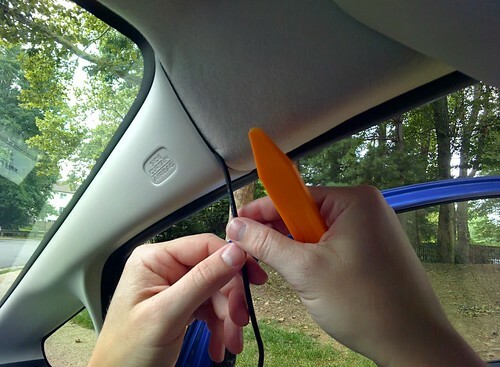 After you follow the door down to the glove box, slip the wire through the plastic cover under the glove box, then over to the center console. 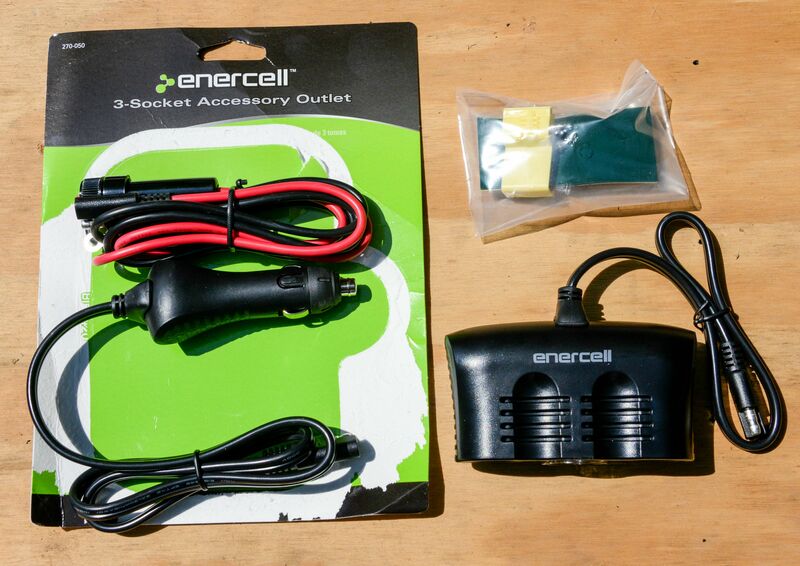 The center console plastic is very flexible and it is surprisingly easy to slip the large 12V power plug over the top of the center console and out the bottom. 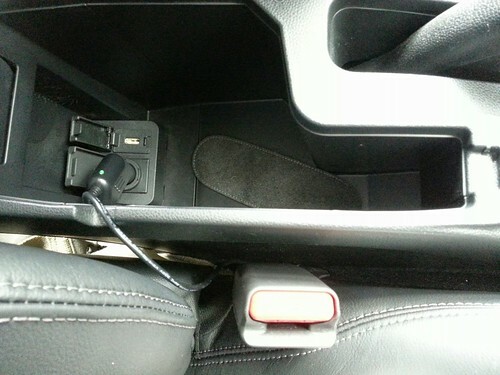 Run the wire over to the center console and plug in the 12V plug. Unrelated to the dashcam, but I thought I would share how easy it is to run wires through the dash. If you slip a wire into the seam on the left dashboard, the wire will fall down to where you can easily grab it from under the steering wheel. The fuse box is right there if you want to splice into power, but I just plugged my cable into the center console. Last edited by simonx314; 08-03-2014 at 02:26 PM. Cool. Post some video quality when you can. Here is some of my dash cam video from yesterday, the first day I had the dash cam, and not one, but TWO trucks almost side-swiped me on the highway! First the giant red truck carrying cars drifts into my lane, and then a Hummer enters my lane almost crushing me between another 18-wheeler (who honks his horn in protest of me entering his lane). Fortunately the Hummer saw me just in time, if he hadn't things would have been bad. You can easily read license plates of vehicles stopped in front of you. Sometimes you can make out partial plates of cars passing you in adjacent lanes. My videos are in rain/overcast conditions, but you can easily find some sample G1W footage for sunny and night video quality. I found this link below helpful when deciding what dash cam to buy, it has some sample images of what the G1W looks like in sun and at night. This is awesome. I've been wanting a dash cam, but couldn't decide yes enough to pull the trigger. This helps tremendously. I installed my BlackVue DR400G day 2 of owning my GK. I installed it identically as the OP did, with the exception that I routed the cords to the drivers side instead of the passenger side. Super easy and took 15 mins tops. 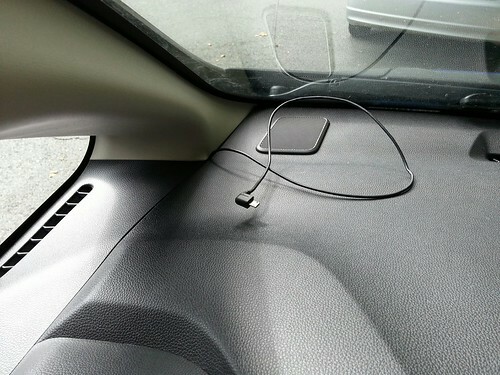 Did you also run the wire next to the side curtain airbag? I wonder if there are any safety concerns there. It doesn't seem like the wire would interfere with the deployment of the airbag, but I wonder if the cable could be propelled out and potentially whip a passenger. It would be awesome if an airbag engineer was reading this and could tell me. Thanks for sharing the video. I've been looking at dash cam's ever since I got hit in a hit-and-run a couple years ago. Do you think its vivid enough to capture license plate numbers? Yes, license plates of cars stopped in front of you are easily legible. Some times you can make out plates of cars that pass you in an adjacent lane. See for yourself by watching the YouTube video I posted earlier. For the highest quality, visit the YouTube page and choose "1080" from the quality options. The camera looks slightly sharper than even the best YouTube quality, because YouTube compresses the video. I should also add that this dash cam records audio, so you could just speak the license plate out loud for your own record. Wow, your quick. I went to delete my post since I saw you already answered my question but you already replied. Of course! Speaking out the license plate. Never thought of that. When I got hit I quickly had to find a pen/paper and jot it down...lead to a stolen license plate. Yes, I did. And I ran the cord the exact same way next to the airbag in my 2008 Fit as well. Honestly I'm not too sure about safety concerns. Obviously, I hope that airbag never has to deploy, but if it does, I think it would be okay. Not an airbag engineer, but did the exact same install simonx did and checked techinfo. My understanding is that the curtain airbag itself is in the bottom of the headliner along the sides of the car, not the A-pillar. The control is in the A-pillar but running the wire there shouldn't interfere. Incidentally I just read on techinfo that there is a recall on some 2015 Fits that had the wrong A-pillar trim installed. 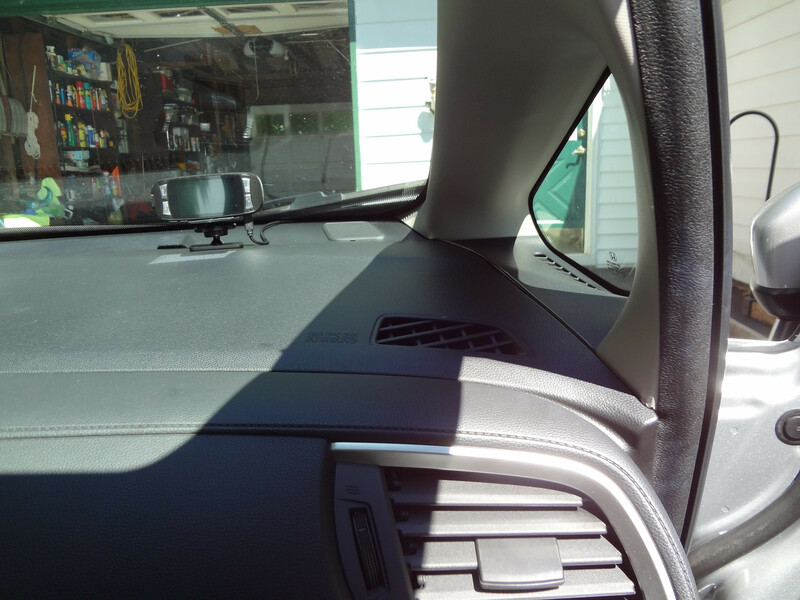 Essentially where the headliner and the A-pillar intersect, using the improper trim could prevent proper curtain deployment. 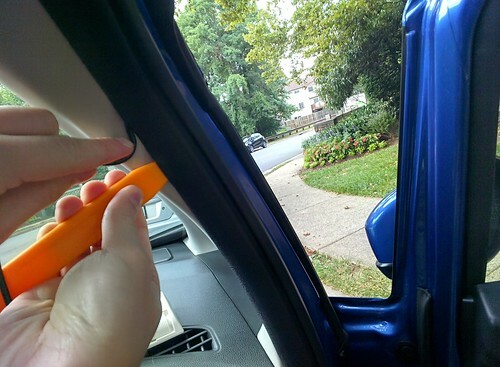 The correct A-pillar trim is imprinted with SRS-Side Curtain Airbag.... the incorrect trim has no marking. I'm also thinking about buying blackbox/dash cam but blackvue is expensive..
Is op's cam good at night? Additional question - and a simple one, I'm sure - anyone have the dash/window cam installed in the rearview mirror position with an EZPass transponder? I'm trying to work that re-arrangement out in my head now. Yes. I got one of those metal clip suction cup things for the EZPass. 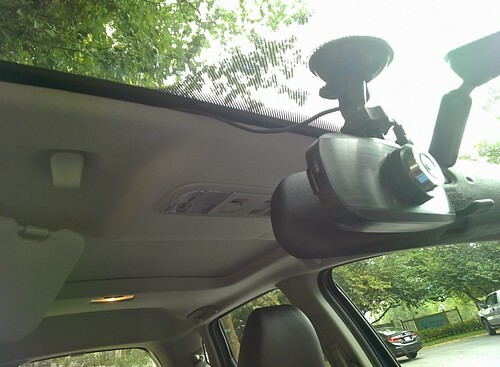 I moved the EZPass as high up as I could and have a mirror clamp mount for the dash cam (just got a Mobius Action Cam.... previously had the G1W velcroed to the mirror but was having issues with it... may have been a fake). You could also offset the EZPass from center if need be. How can this come in handy? Well, when a deer runs in front of you of course, to the tune of a 2k fix. Last edited by Shockwave199; 08-03-2014 at 10:34 PM. Thank you for this! Exactly what I wanted/needed to see. Does it actually make a difference with how your insurance handles your claim if you have it on camera (in the event of a deer strike)? I'd imagine your premiums still get a bump with each incident, no? Gieco liked the footage. The adjuster thought it was awesome. My premium didn't go up, but my overall record figures in too. However, I bumped my premium up myself when I renewed, to include roadside service and and rental, as well as a bump from 100/100 to 100/300k. That deer taught me a lesson, always include rental coverage in your premium. It's worth it. Its in my S2000 $250(amazon) shipped with magic pro box. OP’s camera is great value for the price. I don’t know if this one has wifi or not but the blackvue does. Also has parking mode. For hit and run scenarios. Interesting. I mounted the same camera. I wanted it out of the way, but the suction cup wouldn't stick to those little black dots behind the rear view mirror. I used plastic Velcro to mount a 3" square of Plexiglass to the windshield and then used the suction cup to mount the camera. I used just about the same technique to run the wire. There is a nice space between the headliner and the windshield. Eventually, I moved the camera to the dash, where it's much less obtrusive. The one thing I don't like about the camera is the mount. Since it's curved, I couldn't mount it on the dash and still get a view of the road. 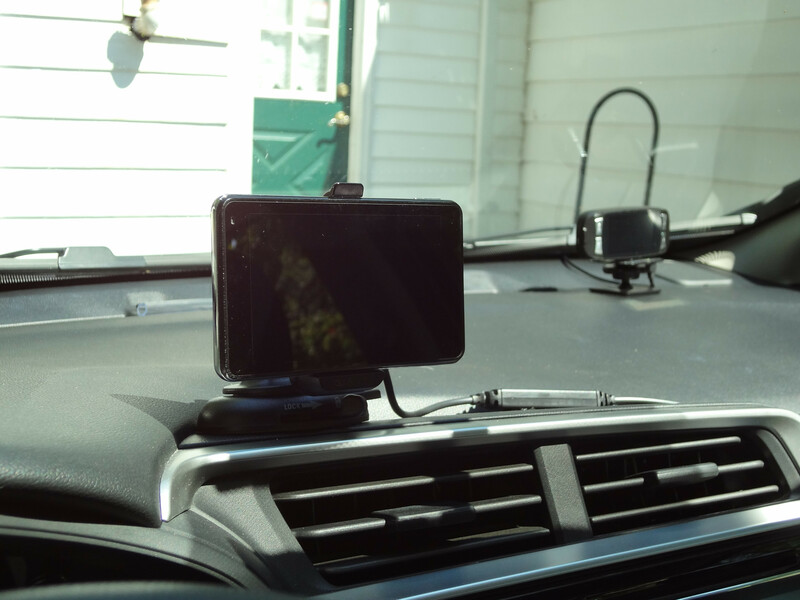 I substituted an old XM radio mount, and that worked perfectly. 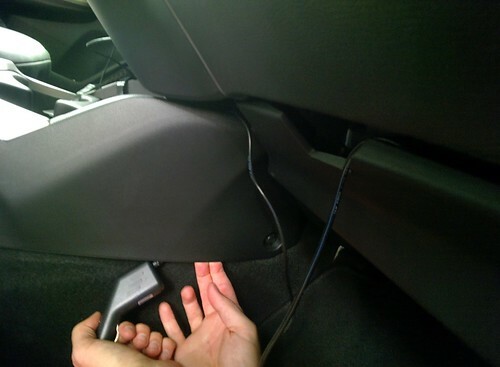 To power the camera, I connected a three-way 12 volt outlet on the floor near the console/firewall to a separate fuse panel under the dash. I ran the camera wire out of site under the dash and plugged it. I can easily remove the camera and wire. 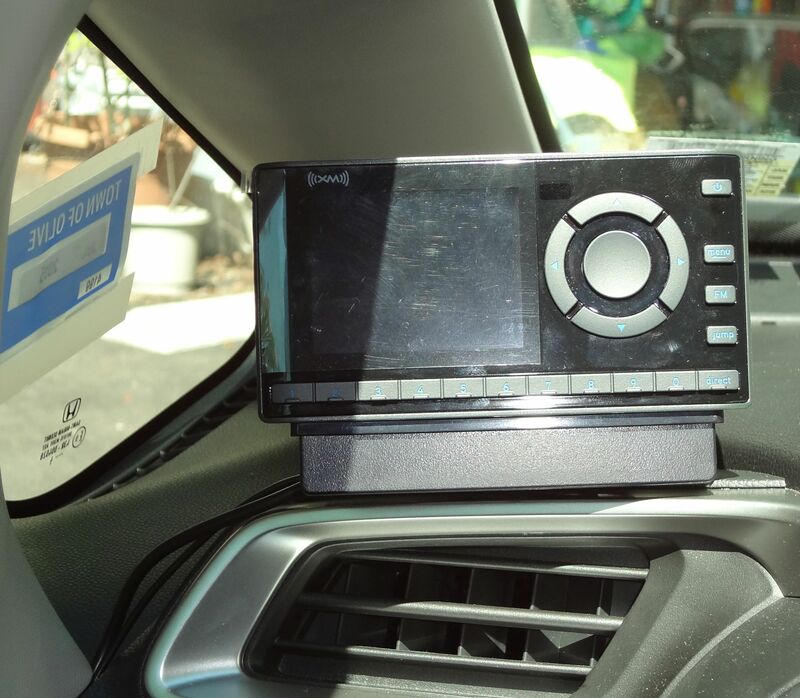 I added an XM radio and GPS in a similar way.